Tag line: "For 2,000 years the Vatican has recorded evidence of evil. May God have mercy on their souls." 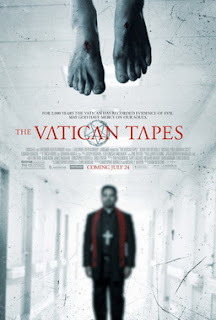 The state of modern horror is such that when I first heard about 2015’s The Vatican Tapes, I assumed it was going to be yet another found footage-style exorcism film. Well, I was wrong; aside from a handful of CCTV shots and the occasional webcam, The Vatican Tapes offers a straightforward narrative, and is not “found footage” in the least. And while the movie does feature a few standard clichés (jumpy video, demon faces that pop up out of the blue, out-of-body experiences, etc), director Mark Neveldine and screenwriters Christopher Borrelli and Michael C. Martin also mix things up a bit on their way to a climax that, quite frankly, was much bolder than I was expecting. But are its unique qualities enough to make The Vatican Tapes a film I’d happily recommend to horror fans? On the surface, Angela Holmes (Olivia Taylor Dudley) seems like an average girl. She loves her father, military officer Roger Holmes (Dougray Scott) as well as her live-in boyfriend Peter (John Patrick Amedori), and, if the turnout at her surprise birthday party is any indication, she has plenty of friends. But soon after the party, Angela’s life is turned upside-down; a simple cut on her finger (suffered while slicing her birthday cake) becomes infected, and she’s checked into a nearby hospital for the night. But this is only the beginning, and when Angela’s state of mind deteriorates rapidly, Father Lozano (Michael Peña), a Catholic priest, believes she may actually be possessed by a demon. To help Angela, the Vatican sends Cardinal Bruun (Peter Andersson) to perform an exorcism, but neither he nor Angela’s nearest and dearest will be prepared for what happens once the ceremony begins. Overall, the film’s cast does a fine job. Olivia Taylor Dudley is likable as the victimized Angela, who is host to something she has no hope of understanding, but what truly impressed me was the actress’s ability to explore her character’s darker side (we get a sense of this early on when Angela, while recovering in the hospital, takes an unauthorized stroll through the nursery). Unlike other exorcism films, Angela’s transformation from lovable daughter and girlfriend to out-of-control psychotic is quite subtle, and there are times we’re not convinced she’s possessed at all, making those moments when the evil does rear its ugly head all the more unsettling. Also good is Michael Peña as the priest who befriends Angela and her family; and Peter Andersson as Cardinal Matthias Bruun, the Vatican representative sent to perform the exorcism (we learn that Father Bruun himself was possessed at an early age, yet this first-hand knowledge of demonic forces doesn’t give him much of an advantage over the being that’s invaded Angela). The Vatican Tapes also boasts some memorable scenes, including a very intense car crash (which was done practically, and not via CGI) and Angela’s above mentioned trip to the nursery (I cringed when she picked up a newborn baby, mostly because I wasn’t sure what she was going to do with it). And while the exorcism scene itself isn’t anything special, the finale certainly threw me for a loop, and I found myself wishing that the movie ran a bit longer than it did (I really wanted to see how the Vatican’s “Warriors of God” would have responded to what transpired at the end). But while The Vatican Tapes does have its strong points, it came up short in one important area: it wasn’t scary. Yes, there are moments that will make you jump, but for the most part I was more intrigued by what was going on than I was frightened (and this is coming from someone who is usually susceptible to exorcism movies; I wore a rosary around my neck for 3 months after watching The Exorcist for the first time). The Vatican Tapes is well-made and quite clever; it is a good film. But if it’s a terrifying experience you’re after, I don’t think you’ll find it here.